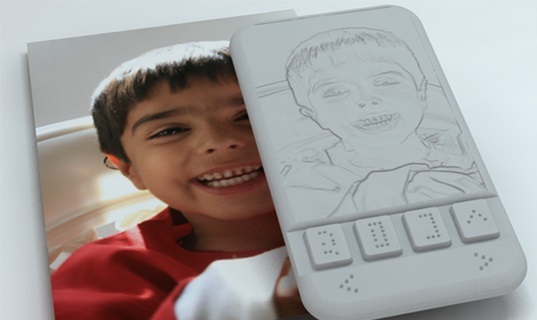 In India, Kriyate Design Solutions has been working on a smartphone for the blind. The phone has been in development for the past three years and will be able to do the basic functions of a smartphone—text messages, emails, calls, etc.—but it will be able to convert text into Braille. The way this is done is via shape memory alloy technology. This means it will utilize metal’s ability to remember its original shape. The screen will be a grid of pins that move up and down to form the characters as needed. This is pretty amazing technology. The idea of the screen to be a grid will allow for users to use touch screen functions as opposed to voice commands, sounds, and vibrations that have been normally used. Sumit Dagar of Kriyate has been working with IIT-Delhi and LV Prasad Eye Institute in Hyderabad to develop the phone. The phone is expected to sell for $184. Qualcomm’s RAY smartphone is a phone for the blind that allows for vocal text messaging, navigation, object recognition, social networking, and more. It works by using certain gestures on the touch screen and the interface adapts to the user’s behavior. Android released Georgie which is an app for blind user with bad eyesight that simply featured large fonts and voice command. The app costs $230 download. Sumit Dagar won a $53,000 Rolex Award for Enterprise in 2012 for ideas with wide impact in the fields of cultural heritage, environment, exploration and discovery, science and health, and applied tech. Dagar said that the money went into prototypes and completing the final version. There’s no date for when the smartphone will be released or what it will be called.